You may recall my previous post about how we started solids with our daughter, but now that we are nearing the end of purees and moving onto table food, I thought I would share some more tips and recipes! I am not sure why people are so turned off by making their own baby food because it's really simple. All you need is a blender and food! I'm not even sure if time is really an issue because it takes less than 30 minutes to prep and then you can store it for 3 months. 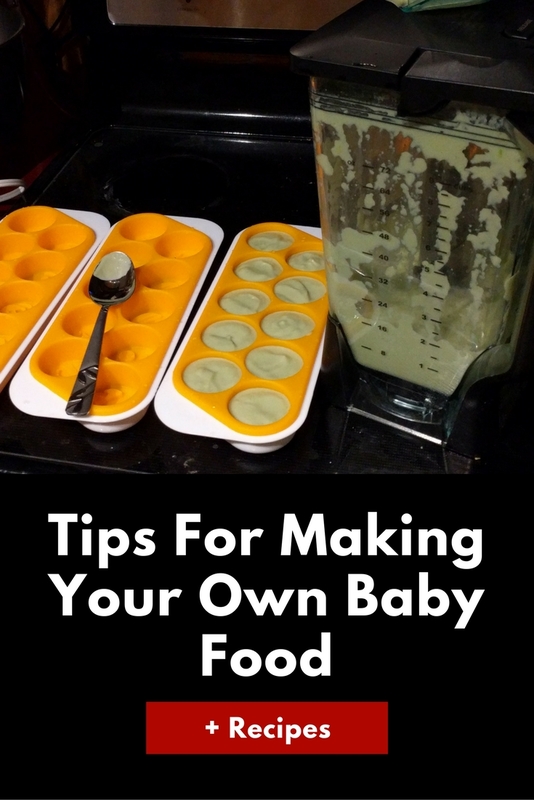 What I think turns parents off from homemade baby food is the recipes that are out there. Heck, I was nervous at first when I started looking up how to make my own food as you see all these fancy mixes with 5-6 different foods in one puree! We are lucky enough to live in a city that offers some free educational programs for parents, one of which was a nutrition class. After taking that class I felt so much better about making my own food. The pediatrician even recommends homemade purees as she claimed that babies who eat more homemade are less picky eaters. Her reasoning is because store-bought purees are designed to always taste and feel the same, but when you make your own purees, it's going to be a little different each time. She says to counter this, you can buy different store brands, don't stick to just one, as this will help them get used to different flavors and textures as well. I personally couldn't find any studies online to back this up, but it makes sense to me, and you can always talk to your pediatrician about it as well. They probably have more access to studies than we do. You do not have to get fancy unless you really want to when it comes to making your own purees. All you need to do is pick a fruit or veggie, and blend it with formula, breast milk, or water. You can combine different fruits and veggies too. With some veggies and fruit, you may have to cook or steam them first, so that may be an added step. In some cases, like with pears, you can buy the canned version instead and blend that. I ended up tossing all the recipes I found and basically just winged it and highly recommend others to do the same! However, if you are a recipe person or just need some ideas, I did provide a few more of my own recipes below. I will note that the water amounts are all approximate as I basically blended and added water as necessary. Plus it can vary each time depending on how ripe the food was or how much moisture was already in the food, etc, so please don't take that water amount as an absolute. Also, feel free to use formula or breast milk instead! Peel the avocados. Toss the peels and pit. Put the avocado and water in a blender and blend until smooth. You may need to adjust the amount of water depending on how thick you want the mixture. Once the mixture is how you like it, pour into ice cube trays and freeze. 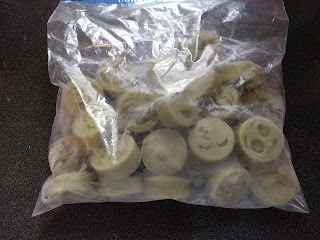 Once frozen you can pop them out and put them in a plastic freezer bag. You can also pour them directly into jars and freeze them that way as well. My favorite is the Ball Mason 4oz Jars. Side Note: I also did a blueberry avocado puree, where I basically just added a package of fresh blueberries to this recipe. Pour both packages of blueberries and raspberries into a blender, along with water. Blend until you have a smoothie like consistency, you may have to adjust the amount of water you add. Pour into ice cube trays or jars and freeze. Once frozen you can pop them out and put them in a plastic freezer bag. When ready to give to your baby, take out the night before and set in fridge to thaw. Once thawed it will no longer be smoothie like, but watery. I like to warm the puree first in the microwave before adding oatmeal. Add oatmeal until mixture is nice and thick. This is one of my daughter's favorite breakfast foods! Side Note: You can probably use fresh blueberries and raspberries as well, but that will likely require less water. 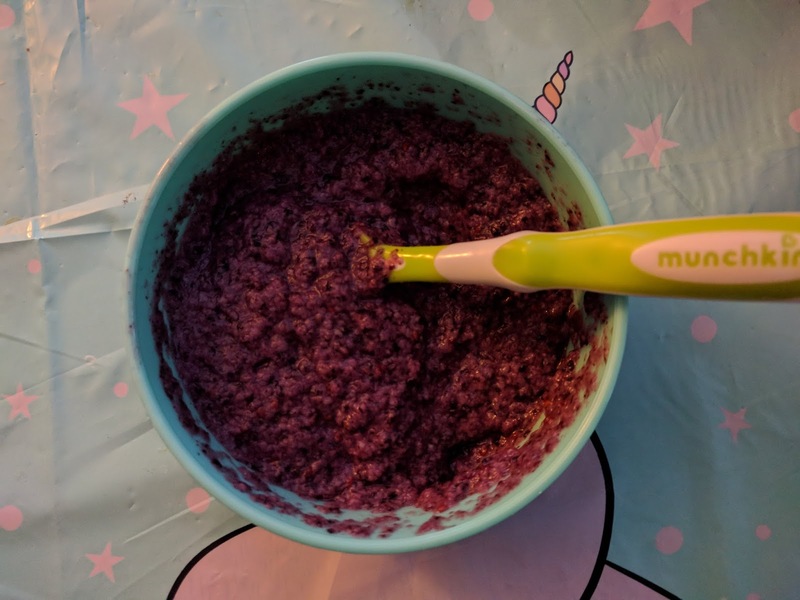 I have done fresh blueberry puree, where I just blended up some blueberries with a little water, so it was still thick so it wouldn't work if you are looking to add flavor to your baby's oatmeal, but would make a nice puree on its own. You could probably use more water. A lot of these recipes are basically just trial and error. This was actually my first time using frozen fruit and I actually didn't expect it to turn to water after I defrosted it, though I should have known since frozen fruit has a lot of water. I used oatmeal to thicken it basically, and it turned out to be a happy accident as my daughter loved it! Cook frozen peas according to instructions on the bag. Let cooked peas cool before putting into blender. Pour in water and blend. May have to adjust water depending on how thick you want the mixture. Side Note: You can also add fresh spinach leaves before blending! Let veggies cool before putting in a blender with water. Blend until smooth, you may have to add more water. Pour into ice cube trays and freeze. Once frozen you can pop them out and put them in a plastic freezer bag. When I was a new Mom (5 years ago), I wanted to make my own baby food. I had a little baby bullet that I NEVER used. Now my son is 5 and my youngest is 3. That bullet is STILL up in the pantry waiting to be used. LOL! Excellent tips for new mommies. Thank you. 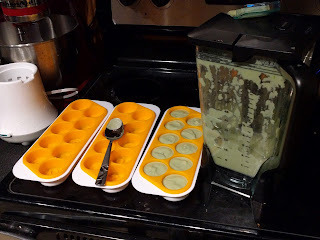 There was actually a mom in the nutrition class who mentioned she hated the bullet and got a blender instead, made a world of difference for her. We already had a blender, so I never even considered getting the baby bullet. Yes I admit people are usually too lazy to make food by themselves for their babies, including me as I used to do so. However for some occassions we made own food with fruit and vegetables as our babies had grown up around 1 year old.. These are great tips. If I could go back in time I would definitely make my own baby food. This is great for new moms! These sound like lovely nutritious recipes. I think marketing has a lot to do with why many parents buy store-bought baby food. We took the baby led weaning route and offered solid foods from the start. I think you are so right about kids being less picky when they eat homemade food. We didn't do baby led right away as our baby only had 2 teeth and our pediatrician said sometimes babies can actually get turned off on eating solids if they gag or choke, which is more common with table foods. All babies are different though, some take to it and some don't. It's important that parents don't force it or they will have bad associations with food later on. We introduced table foods once she got more teeth and it was easier for her to chew. If and when I have my next child, I want to make our own baby food for certain. You should take additional care if any youthful youngsters, pregnant ladies, more seasoned individuals or any individual who is malevolence be going to the capacity.